Homemade marshmallows without corn syrup–use maple syrup instead! I’m thinking you have some marshmallow needs in this cold weather. Since my DNA is 50% Texan and 50% Californian, let’s just say that I am not handling the cold in the Midwest very well right now. Hot cocoa is practically a food group in my house this week, and I’m not even ashamed. I make Camille a kid-friendly version of hot cocoa (2 teaspoons unsweetened cocoa powder + 2 teaspoons coconut sugar mixed into about 2/3 cup of warm almond milk), and she loves it. Well, I thought she loved it, until she had a few marshmallows on top and then I really saw her exude love. The truth is, I’ve started letting Camille have sugar. It’s not every day. I can’t even remember when it happened. I *think* it was when my mother-in-law was in town. While shopping at Trader Joe’s, I was eating mango gummy candies (gummy candies are the way to my heart–not chocolate, not cake, not ice cream, just GUMMIES). Camille was in tow with us, and I just felt bad eating in front of her. I gave her a little tiny bite. She liked it and reached her hands up for more. All in all, she probably ate half a gummy (and I was half-way full of guilt for days). Fast forward a few weeks ago, and I’ve got a bag of mini marshmallows in the car, and she was being so good and patient while I put her in and out of the carseat a million times during errand running, and I decided to fill up her little paw with a few of them. You guys, she went crazy for them! Real sugar does that, I guess. My Mom quickly clued me into what an extreme choking hazard mini marshmallows are, and I never let her have them again. In my gut, I know that Camille loves food so much, she would never choke on it and waste it. Seriously, have you seen my instagram where she eats brussels sprouts, entire bowls of broccoli and fennel salad? This kid, I tell ya. She deserves a dang marshmallow. So, I made my regular marshmallow recipe with maple syrup in place of the corn syrup. There’s still a bit of regular granulated sugar in these babes, but I think it’s fine in moderation. 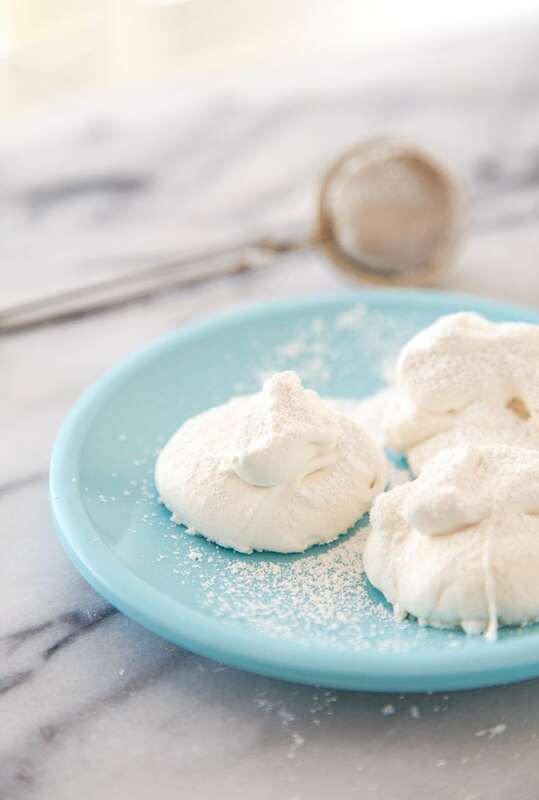 We love these homemade marshmallows without corn syrup. Camille calls them ‘ma-marshes,’ and I’m sorry I just shared that with you. One of my pet peeves is adults repeating words the way kids say them, and I swore I’d never do that. But I just did. And according to every parenting book, I’m supposed to correct her to say ‘marshmallows,’ but really, I call them ma-marshes now, too. I haven’t tried subbing maple syrup for corn syrup in all of my marshmallow recipes yet (but I’d like you to meet: vanilla bean marshmallows, chocolate marshmallows, mixed berry swirl marshmallows and raspberry marshmallows. I will say that a maple syrup marshmallow has a slight graininess to it that gets more pronounced over time. If you make and eat these the same day, you won’t notice it. If you hoard them in the pantry and dole them out two-by-two to your kids, they’ll get grainier as they sit. But the good news is that you won’t find a kid that won’t eat them, even on day 5. 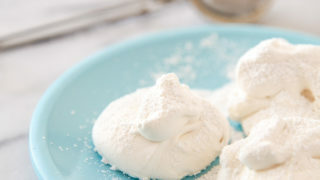 You can scoop the marshmallow fluff with a cookie scoop into little mounds (that set faster), or, you can spread them into a 8×8″ square pan, and let them set for 3 hours before dicing into cubes with a powdered sugar-dusted knife. Your choice. Just make these homemade marshmallows without corn syrup recipe, and let me know how they go! You can also let me know how your kid says ‘marshmallows.’ I’ll tolerate it. 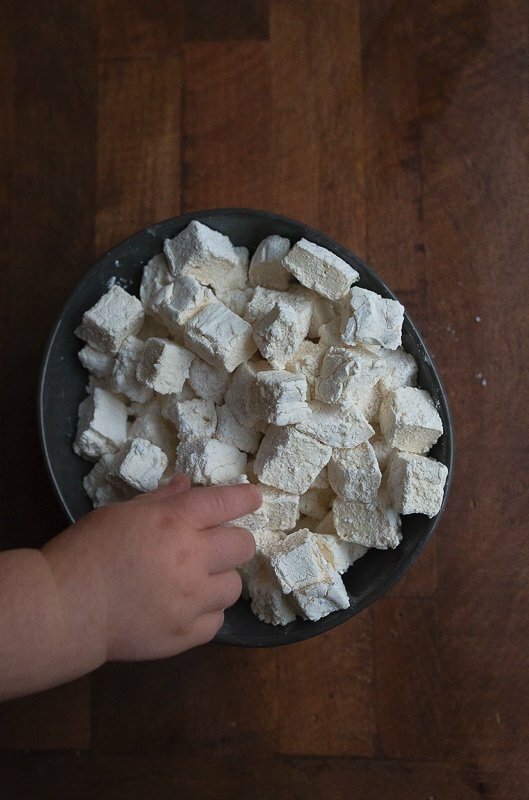 Yep, this homemade marshmallows without corn syrup recipe is from last year, but I snapped a new photo (the one with Camille’s little baby hands) an wanted to re-share. Thanks for re-reading. 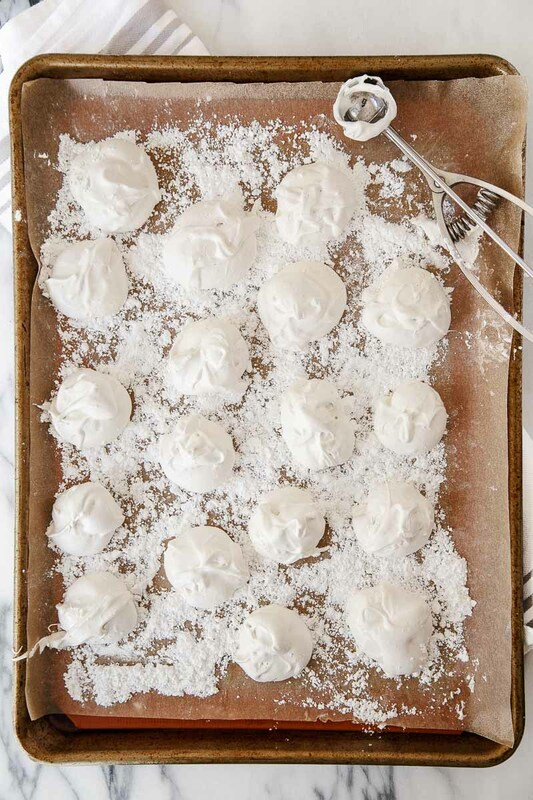 Have ready a baking sheet lined with parchment paper and sprinkled with a light layer of powdered sugar. In a medium sauce pan, stir together the granulated sugar, maple syrup, salt, and 3 tablespoons of the water. Turn the heat to high and bring to a boil without stirring. Clip a candy thermometer to the edge of the pan, and boil until it reaches 238-degrees Farenheit. Beat the mixture for a full 10 minutes on medium speed. Spray a mini cookie scoop with cooking spray, and make a test marshmallow on the baking sheet. Does it hold its shape relatively well? If not, scoop it back into the bowl and beat on high for 2-3 minutes until the mixture is more stiffer. Stir in the maple extract and mix until combined. 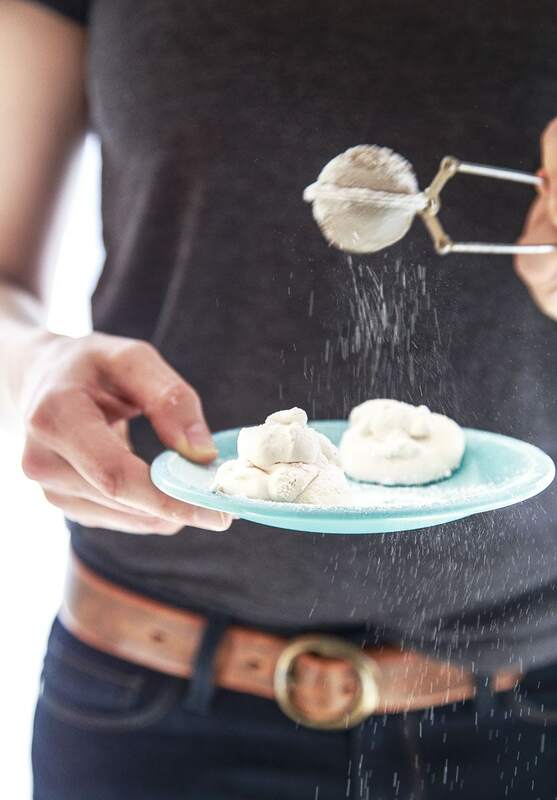 Using a mini cookie scoop that you spray with cooking spray between each scoop, scoop out 18-20 marshmallows onto the prepared baking sheet. Let the mixture set uncovered for at least 90 minutes. 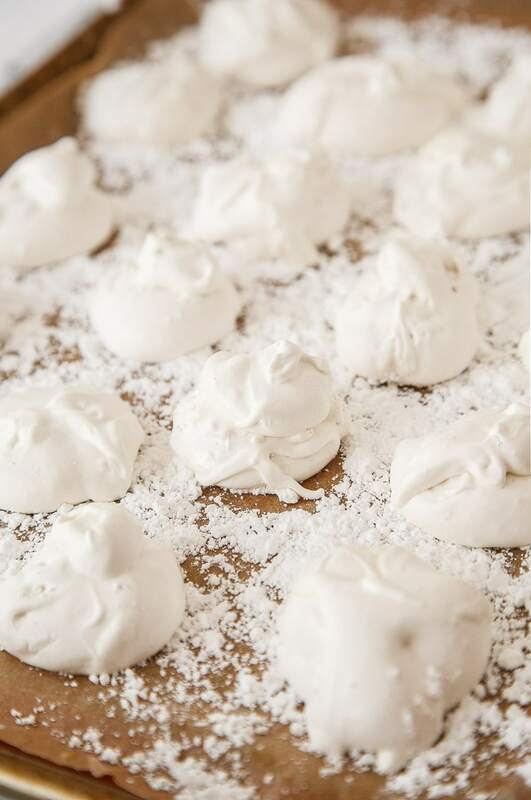 The longer they sit out uncovered, the more they take on the texture of store-bought marshmallows with a firm crust. Sprinkle the marshmallows with the extra powdered sugar and allow to dry. Maple in marshmallows….such a good idea! Why have I never done this? Thank you so much for sharing! How could a softer marshmallow be a bad thing? Totally trying these! Okay, I love this. My wife loves this. We’re making these. Yes, anti-corn syrup people here. We blame the corn syrup for disrupting the hormones and making is harder to burn off calories and loose weight. At least that’s what we tell ourselves. These are awesome! Duuuude! I have no problems with corn syrup so long as I’m not using it all the time but I am totally in love with these. I actually dig their softer texture especially in that you have little dollops of them. Rustic marshmallows are a thing!? And just imagine how gooey they will be toasted! this is amazing!!! Maple syrup marshmallows look and sound SO miraculous! Have you tried using golden syrup as an alternative to corn syrup? It has the same consistency (you can make a 1 to 1 substitution), but is made with real sugar. I’m totally on board with maple syrup marshmallows that are soft! These literally look like clouds and I agree, waiting for the marshmallows to set is just like punishing someone! It’s so darn difficult! I made homemade marshmallows for the first time last year, and now, I’m smitten. I don’t have a problem with corn syrup in the slightest, but I’m always up for trying a different method! Beautiful! GAH, Winslows is the best. I have dreams about their berry pie. And this recipe looks brilliant! The last time I tried to make marshmallows I made a huge mess and broke my hand mixer. Love the easier version! Camille is the cutest little baby foodie!!! and I love this recipe-totally pinning!!! Which grade of maple syrup is recommended?